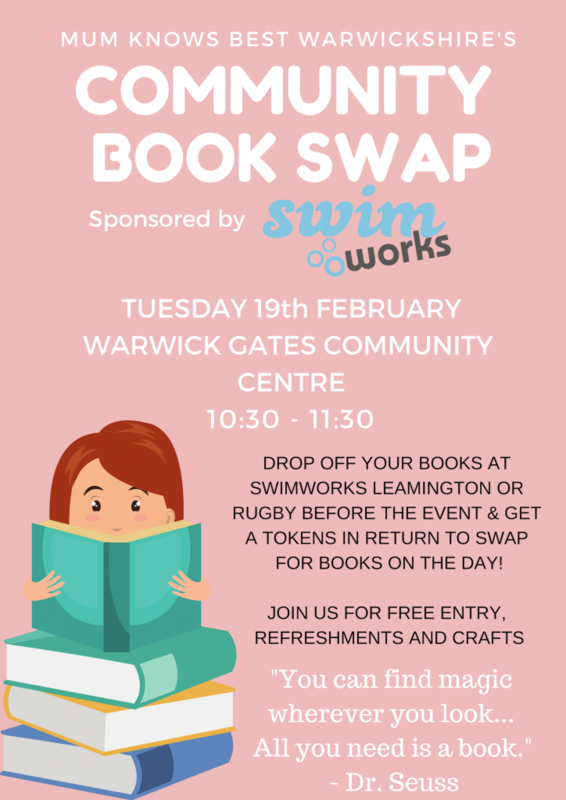 Come and join our free book swap event in Warwick this February half term! This event is suitable for all ages from babies to adults because you’re never too young or old for a new book! If you’d like to come you’ll need to first donate your books for swapping, you can do this at one of our local volunteers homes or you can visit either Swim Works in Leamington or Rugby to swap your books.. this will need to be by the weekend before the event at the latest to enable us to sort all the books into age categories before the event. Books MUST be in excellent condition. You will be given tokens in return to swap on the day, one per book and a maximum of five tokens will be given but you can donate as many books as you wish. After all books have been swapped you’ll have the opportunity to purchase additional books for 50p each with proceeds going to charity. This is a free event with free coffee and tea and each attendee will be given a paper goodie bag to hold their new books and there will also be crafts on the day too. Many Thanks to Swim Works for offering to sponsor this event and ensure that books remain free for all! Posted on February 11, 2019 by Nikki. This entry was posted in Mum Knows Best Warwickshire Book Club, Nikki's Night Time Blog, Places to visit, Uncategorized, Whats on in Warwickshire. A Sunday lunch.. with a twist!